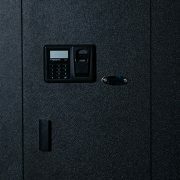 The BlumSafe is a high-quality wall safe for the convenient storage and viewing of your watches and other valuables, featuring the well-regarded BOXY® Brick modular winder system, and a highly secure biometric fingerprint/keypad lock system. Your BlumSafe comes equipped with everything that you need — winders, plug-in wall power connection for winders, batteries for light and lock, mounting bolts, keys, allen wrench for backup key access and instructions. Some assembly and installation required. Your watches matter to you, whether you wear them “hard” every day, or coddle them as an investment to be traded or, better yet, passed to the next generation. Keeping your watches in a winder on your dresser is convenient – they are easy to look at and stay wound, so you can wear the watch you like on a moment’s notice. But with that convenience comes risk. According to the U.S. Justice Department, more than one out of ten homes in the US is the victim of property theft annually, mostly from people we invited into our homes. And watches make a good target for thieves. On the other hand, how much fun is it to lock away your beloved watches in an out-of-the-way safe? At BlumSafe, we believe you should never have to wonder or worry about the security of your watches. We also believe that this security should never come at the cost of convenience. BlumSafe convenience means being able to admire your watches in a well-lit, instant opening, easily concealable wall safe. Ease of Access Yes, but for you and anyone else, including thieves Possibly, but at the expense of floor space and concealability. Otherwise, you are likely to be bending down to view and retrieve your watches in an inconvenient location. Yes, takes no floor space, permitting placement where you want it, with your valuables at torso-level so you don’t have to bend down and strain your back to retrieve and admire them. Safe can be opened instantly with biometric fingerprint scanning or with digital lock. Ready-to-wear Yes – your watches are always wound — Yes, your watches are always wound. 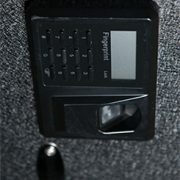 Protection from Professional Thieves — With the right tools and thirty minutes, the skilled, veteran thief can break into or remove virtually any consumer safe. 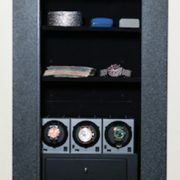 To protect your valuables you must deprive the thief of time by layering your defenses, key among them being concealment of your safe – a leading attribute for wall safes like the BlumSafe. Flexibility of Use — — Yes. 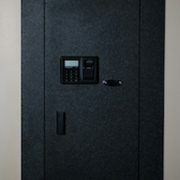 The BlumSafe features two fully adjustable shelves for jewelry, cash, guns, and other valuables, and key hooks on back of door. Winders can also be removed from the safe for outside use. Customization — Possibly Modularity, up to twelve winders can be added as your collection grows. Value Winders are generally expensive and handsome — handsome advertisements for the valuables inside of them. — Absolutely yes – for the price of a luxury tabletop winder or an inexpensive floorsafe, you get the best of both — a wall safe AND up to 12 winders! 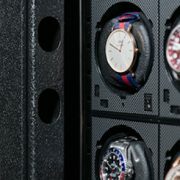 Base holds up to 12 high quality, velvet-lined Boxy watch winders in a 3X4 configuration, add winders as you need them! We buy similar watches; large packages as well as one at a time. 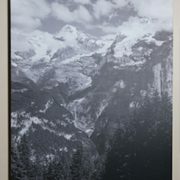 Click here and visit our eBay store!